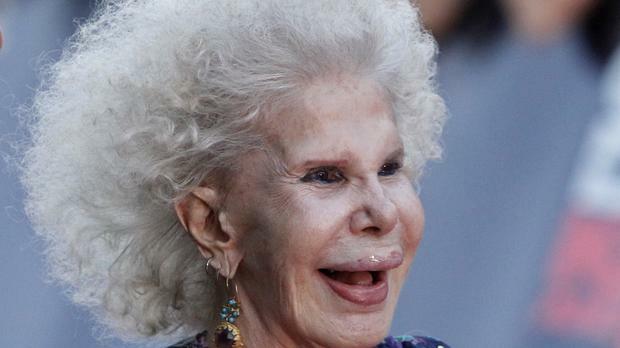 The Duchess of Alba, one of Spain's wealthiest and most colourful aristocrats and recognised as the world's most titled noble, has died. She was 88. Maria del Rosario Cayetana Fitz-James Stuart y Silva was related to Winston Churchill and shared toys with the future Queen Elizabeth II - they were born less than a month apart - while living in England as a girl. Twice-widowed, the fabulously wealthy noble had an outspoken nature and a predilection for extravagantly colourful, almost hippy-style clothing even late in life. Known simply as Cayetana, she was for decades a mainstay of the gossip press. She died at her Duenas Palace residence in Seville on yesterday from pneumonia, a palace spokesman said. Her children feared a potential gold-digger, although Mr Diez renounced any claim to the family fortune. The duchess moved to appease her heirs by dividing up most of her vast estate among them a few months before the nuptials, handing out palaces and mansions to all. With estates dotted across mainland Spain and on some of its islands, she was known for being able to crisscross the country without having to spend the night in a property that was not hers. She also had one of Spain's most dazzling art collections, including works by grand masters Goya, Rembrandt and Velazquez. The Duchess was born March 28, 1926, in the sumptuous Liria Palace in the centre of Madrid. A Grandee of Spain and the holder of six dukedoms, she could trace her noble lineage back 17 generations. She inherited her titles from her father, with whom she lived in London - where he was named Spanish ambassador - while hostilities raged in Spain's 1936-39 civil war. She took over the house of Alba, becoming its 18th leader as well as the 11th Duchess of Berwick, to mention just two titles, upon her father's death in 1953. She married Luis Martinez de Irujo y Artacoz in 1947 in what was described as one of the costliest weddings seen in Spain. Newspaper El Pais later wrote that the wedding had cost 20 million pesetas - a fortune in a country still recovering from the ruinous civil war. She spent much of her time in the southern city of Seville and was named a Favourite Daughter of the Andalucia region in 2006. The honour caused protests by a small group of local farm workers who felt she did not deserve the title, having spent her life living in luxury. The feisty aristocrat reacted by calling the protesters "delinquents" and "a handful of nuts that I don't care about". The farmers took her to court; she was initially ordered to pay a fine, but was later acquitted on appeal. In late October 2011, weeks after her wedding to Mr Diez, the Duchess slipped on a rug at her Seville palace and cracked her pelvis. She suffered a fall while visiting Rome with her husband in mid-April 2013, and was operated on there for a broken femur.